Some individuals are born with thin lips, while others develop thinning of the lips as part of the aging process. For those desiring greater volume or a more uniform shape to their upper and/or lower lips, a lip implant can be used to permanently augment the lips. For temporary results, some patients opt for lip injections with JUVÉDERM VOLBELLA® XC or another dermal filler. There are two main methods of increasing the volume of the lips: nonsurgical injectables or surgical implants. During the consultation process, Dr. James Matas, a board-certified plastic surgeon, will review the benefits of each method, determine your candidacy, and help you decide which type of lip augmentation can best achieve your goals. Facial implants can be used to augment the lips and either restore lost volume or enhance the natural volume. The size of the implants can be customized to meet the expectations of the patient. Lip augmentation can be performed on the upper lip, lower lip, or both. This surgical procedure does entail some downtime, but the results are considered permanent. Using injectable dermal fillers, volume can be added to the upper and/or lower lips. There is no downtime associated with this type of lip augmentation. The results of lip augmentation with fillers typically lasts 9-12 months before a follow-up treatment is required. Women and even men, from their 20’s (in the case of genetic thin lips) to their 60’s could have this procedure performed. The procedure is much more popular among females, but can produce a normal size and shape for men who lack lip volume. Dr. Matas has extensive experience using facial implants. 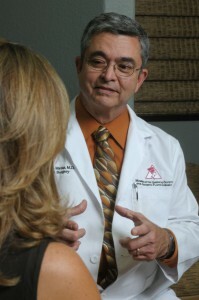 At your initial consultation, he will discuss your goals and motivations, along with assessing your physical and emotional health and reviewing information you provide about previous surgeries, past and current medical conditions, as well as nutritional supplements, herbal remedies and pharmaceutical medications you take. He will examine the size and shape of your lips, as well as the relationship between them compared to your other facial features. He will take measurements that will help him determine the proper implant size(s) to use. Different sized implants can be used for the upper and lower lips to balance the size of mouth and face together. He will advise you to avoid taking aspirin, ibuprofen products, Vitamin E and certain herbal medications before the procedure, as these can cause increased bruising and swelling. The procedure is performed using local anesthesia and a dental block, so no discomfort is felt during the treatment. First, the block is administered. Then, a small incision is placed along the outside corners of the mouth. A pocket or space is then created where the implant will be permanently placed. A pre-measured lip implant is then placed in this pocket and final positioning is made. The small incisions are then closed with sutures and cold compresses are applied to reduce immediate swelling. The procedure is performed in a sterile manner inside a treatment room and takes approximately 30-60 minutes to complete. You should expect moderate bruising and swelling, and general tenderness around the lips and mouth for a few days. We will ask you to apply cold compresses, use certain medications to reduce bruising and swelling and to perform a certain type of manipulation of the implant itself. It may affect eating and chewing for several days, but no longer. You can get back to work within a day or two, but should avoid vigorous physical activity until swelling has subsided. After lip augmentation, you will have fuller lips with a uniform shape and better balance to your face. You may feel more youthful and attractive, and enjoy having photographs made again! And, unlike lip injections that are temporary, the results from your lip augmentation are permanent. The implants can be easily removed, however, should you ever wish to change sizes or change your mind about having implants altogether. Dr. Matas designs a custom-tailored treatment plan for each lip augmentation candidate. As a result, there is no set price for the procedure. There are a number of variables that impact the final cost of lip augmentation, including the type of augmentation, the degree of volume enhancement, and whether one or both lips are being enhanced. At the conclusion of your initial consultation, Dr. Matas can provide you with an accurate quote for the price of your customized lip augmentation. Patients who might benefit from a low monthly installment plan with little to no interest may qualify for one of our financing options. To learn more about financing your lip augmentation, please contact a member of our staff today. How regularly do you perform each type of lip augmentation? How will the lip augmentation procedure be customized to meet my unique needs? Are there any preparations I need to make before the procedure? Are there before-and-after photos of previous lip augmentation patients I can view? Most importantly, your lip augmentation surgeon should make you feel comfortable and confident in his or her abilities. Clear communication with a skilled and experienced plastic surgeon can be an essential component to attaining the results you desire.